On my summer vacations in upstate New York, my cousin and I used to while away the hours on an Atari 7800, racing in Pole Position, fighting with tanks in Combat, or trying to figure out how the heck to play E.T. 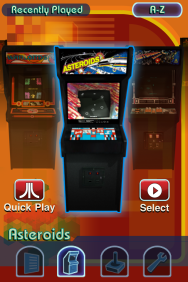 Now Atari’s packed 100 of its greatest hits into a new app for the iPhone and iPad. Atari’s Greatest Hits is free and comes with your own complimentary copy of Pong. In addition, you can download 18 titles for the Atari 2600 and 92 classic Atari arcade games (some of the games, like Missile Command, are available in both arcade and console flavors). There’s an attractive catalog of titles that you can browse by swiping through cabinets and classic box art; for each game you can see screenshots and read a description. However, you can’t purchase individual titles: You either have to plop down $1 for a pack of four or $15 for all 99 additional titles. The games have all been updated to use touchscreen controls and several of them even feature Bluetooth multiplayer for head-to-head competition with your friends. On some games you can adjust the control methods—choosing, for example, between a roller ball and a disc—and on console games you can even summon up a faux Atari console interface, complete with Game Select and B&W vs. Color switches. Sadly, the “greatest hits” moniker may be more marketing than anything else: While titles like Video Checkers and Slot Machine made the list, there’s no Pole Position or Joust. But still, if you’re looking to recapture some nostalgia of video games gone by—and you’ve got a device running iOS 3.0 or later—Atari’s Greatest Hits might hit that sweet spot.